This is the second of Aeromaster's Korean War T-33 sheets. These planes were not used in combat (at least, I don't think so) and while armed with two .50 cal machine guns, I think those were mostly just to make the pilots feel good about themselves. Mostly they were used for pilot hacks and to let the desk pilots get their required hours per month for flight pay. When it comes to kits, you have two actual choices. One is the Hawk/Testors kit of rather ancient fame. The other is the newer Hobbycraft/Academy version. You need to note that these planes all used the smaller 265 gallon tanks that were slung from under the wing tips and not attached to the outer part as was more common in later years. I don't know if these come with either of the kits, but a reference to a set by the now defunct KMC is given. This sheet was printed in 1997. First is 'Skoshi Chief' from the 4th FIW in 1953. The tail and fuselage band are provided, however, only one fuselage band is on the sheet so if you want to do more than one plane, you'll have to break out the paint for this item. Next is 'Stove Pipe Sue' from the 51 FIW. 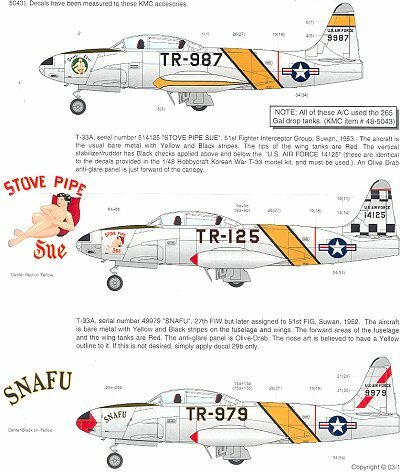 Tail markings for this one will have to come from the Hobbycraft 'Korean War' boxing of this kit. The tip of the wing tanks are red. Finally, from the 27th FIW is 'SNAFU'. This plane has a red nose and tank tips. The horizontal stab stripes are provided on the sheet. 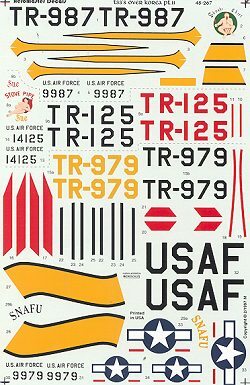 Any of these schemes will probably be a major improvement over the kit decals! There are enough common markings on the sheet to do one of the aircraft. Some of the decals are in two parts to ensure proper registration.